My underrated movie choice has to be Killer Klowns from Outer Space. The film does get pretty decent reviews from horror fans but I just feel as if it doesn’t really get the credit it deserves. One of my favorite things about it would have to be the special effects. There’s no CGI or computer effects in the film at all, adding to the raw feel of it. The klowns? Real costumes. The sets? Real locations. The finale scene? A miniature set. In my eyes, this is horror done right. Fun yet creepy. Weird yet laughable. Low budget yet good. This is one of those movies made by horror fans, for horror fans. The overall atmosphere of the film makes you feel like you’re at a drive-in movie theater, and brings back that long dead feeling of movies that were fun. In recent years, films like Machete and Hobo with a Shotgun are reviving this feeling, and I personally think it’s the best thing that could ever happen in a world filled with movies about kings with speech impediments and iron ladies. So, before watching this film, remember that this isn’t like The Sixth Sense or Let Me In. The only emotion that should be felt by the viewers is happiness and enjoyment. Now I know some Roger Ebert-loving movie snob will say it’s a terrible movie because the dialogue isn’t well written and the acting isn’t top notch and plot really doesn’t make sense. And do you know what I think about people like this and their opinions? 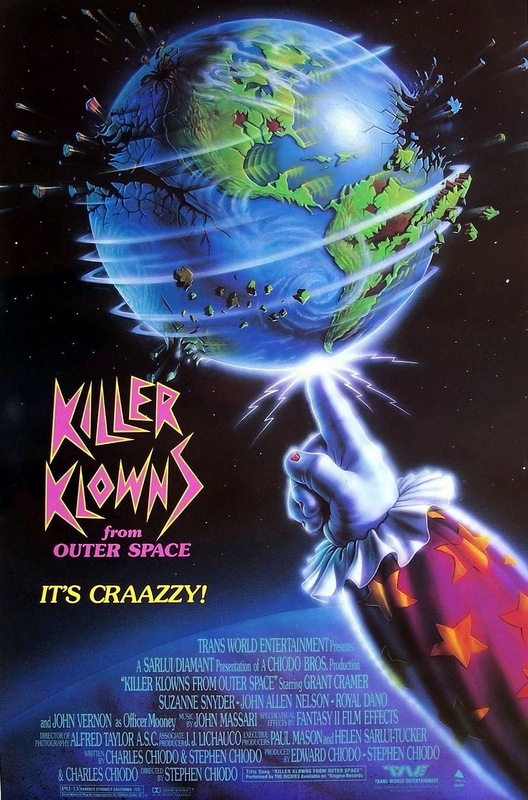 If you don’t want to have fun watching a movie then go to a funeral or watch paint dry, because horror fans like to enjoy their movies, and Killer Klowns from Outer Space is one of the most entertaining movies ever made. I mean, how could it not be? It’s got clowns!